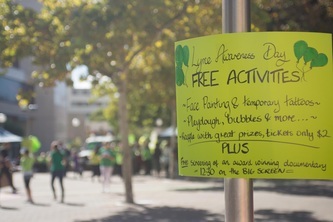 The Days Round Up: The Perth Lyme crew had a huge day, with lots of activities and Lyme awareness happening. 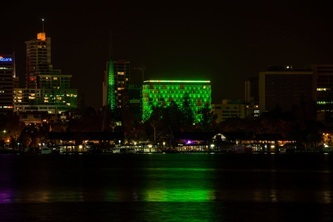 See below for : Photos from the buildings/landmarks that lit up green in Perth ; Photos from the day ; A you-tube video of Today Tonight interview with Western Australian Lyme patients. 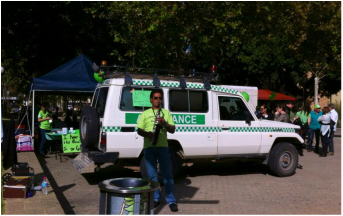 A link to the petition for Australian Lyme patient recognition and treatment. "We gave out over 1000 Lyme awareness pamphlets (pamphlets were those from: Lyme Disease Association of Australia or Karl McManus Foundation). Each pamphlet was asked for and none was forced on anyone. As people were walking by it was hard to count, but our estimate was that at least 100 lymies and their family/friends attended over the extent of the awareness event. Hundreds of members of the public passed by our stalls". Thank You to the Perth Cultural Centre, Bells Tower and Council House for their valued support and contribution to the success of the Lyme awareness day. 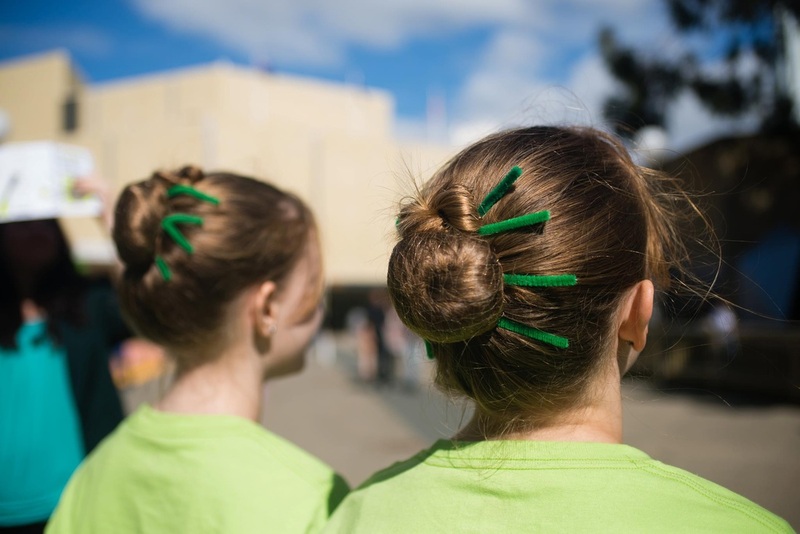 Free activities: Face painting, and temporary tattoos, play dough, bubbles and more. Raffles with great prizes. Plus Free Screening of an Award winning documentary “Under Our Skin” at 12.30 on the big screen. 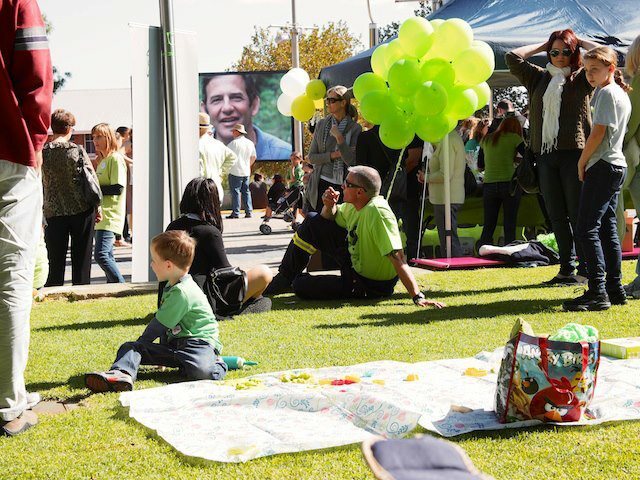 Top Right: Perth Crowds watching "Under Our Skin" on the big screen. Bottom Right: The "Tick Hair-do's" designed and displayed by these sisters attracted quite a bit of attention, nationally and internationally. Ailsa Burgess, Theresa Potgieter, Monika Smith and Leanne Downie - as well as everyone that contributed and came along to help make this event so successful. Thanks also to Ailsa Burgess for organising Australia's first landmark, The Bell Tower, to commit to lighting up green for Lyme awareness. We were thrilled to announce that Perth’s iconic Bell Tower was to be added to places such as: Toronto's CN tower, Niagara Falls and the Peace Bridge to USA going green for Lyme Disease Awareness !!! 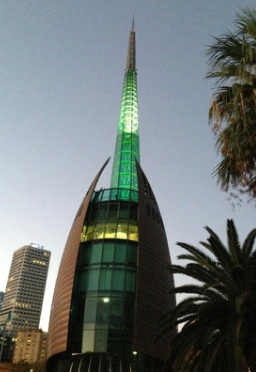 The Bell Tower was the first of many landmarks / buildings in Australia, including another couple in Perth, that subsequently "lit up for Lyme". 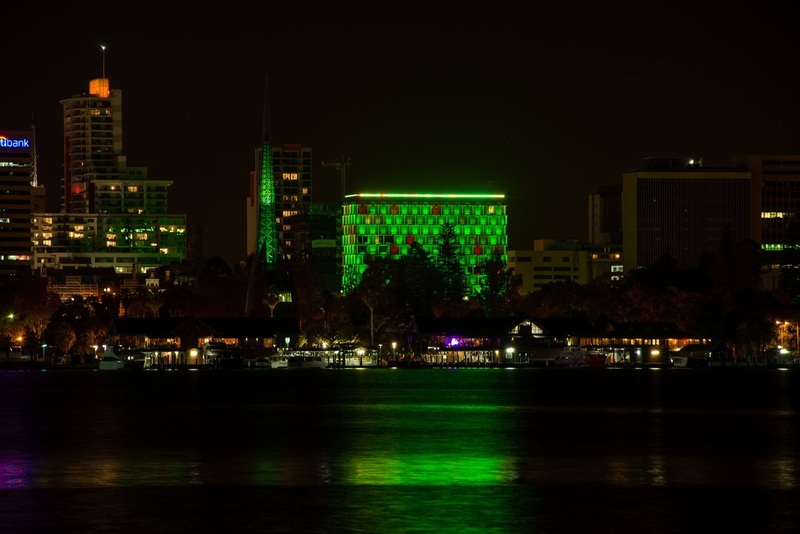 See Australian Landmarks Shining for Lyme further details on other landmarks / buildings around Australia, including two more in Perth: The Council House, and Northbridge Piazza and surrounds. Big Shout outs also to: Joseph Smith for entertaining the crowds with some saxophone tunes ; Jaimie Murray for organising an ambulance to be at the awareness event ; The Chryalis youth group for all there help. ﻿Petition: ﻿shout out also goes out to Theresa Potgieter, for the petition she started. Whilst it was started for the Western Australian public, it quickly went Australia (and Internationally) wide, reaching over 2,000 signatures by May 2013. The petition was addressed to the Australian government, and titled: "Lyme disease patients in Australia need urgent recognition and adequate treatment"
Thank you to Ailsa and Sarah Burgess, Jamie Murray, Tina & Andrew Merryband who provided the photo's of the day seen in the below albums. Awareness Event: Public Screening of award winning documentary "Under Our Skin"